WILMINGTON -- Roughly 200 revved-up bikers staged a deafening rally Saturday morning on the New Castle County courthouse steps in support of the Thunderguards Motorcycle Club's push to remain at their Riverside clubhouse. 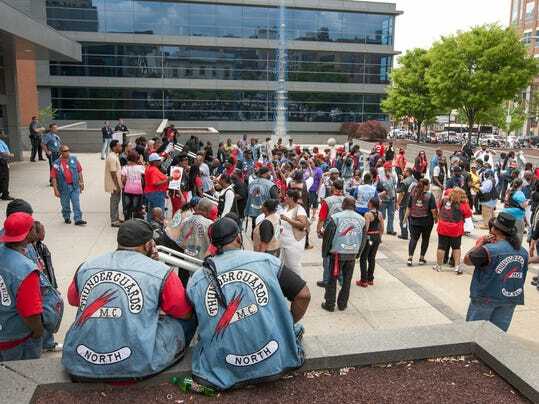 On May 15, representatives from the black motorcycle club will appear in county Superior Court on charges that the clubhouse in the 2800 block of Northeast Blvd. is a criminal hotbed, linked to 15 shootings – at least four of them deadly – over the past eight years. Attorney General Beau Biden has requested an emergency injunction to force the group to vacate the property, attributing multiple killings, stabbings, assaults, drug dealing, gambling and prostitution to the "national outlaw motorcycle gang." City officials have seized two illegal gambling machines and cases of alcohol from an illegal bar operating in the clubhouse. But during the one-hour protest, Thunderguard members accused politicians of racial profiling, arguing that they should not be held responsible for street crimes committed nearby. The decaying white stucco building is located in front of the Riverside housing project in one of the city's most dangerous sections. "Not one individual Thunderguard has been convicted or arrested for violence," said Pastor Kurtis Davis III, the national chaplain for the organization. He said motorcycle clubs from across the mid-Atlantic attended Saturday's rally. Wilmington police officers cordoned off the area. Davis also disputed the gambling charges, explaining that the games confiscated were similar to touchscreen bar video games. The clubhouse is open from midnight to 4 a.m. on Fridays and Saturdays and serves alcohol for social parties, he said. Patrons are searched for weapons and drugs at the door. Incorporated in 1995, the organization counts more than 1,000 members from Claymont to Seaford. A fixture in the community, Thunderguards have organized book drives, Halloween parties, backyard clean-up days and rides supporting research for Multiple Sclerosis and cancer treatments, Davis said. The group plans to rally Monday in Rodney Square before walking to the courthouse. A third rally is planned Thursday at the courthouse before a hearing in the case.